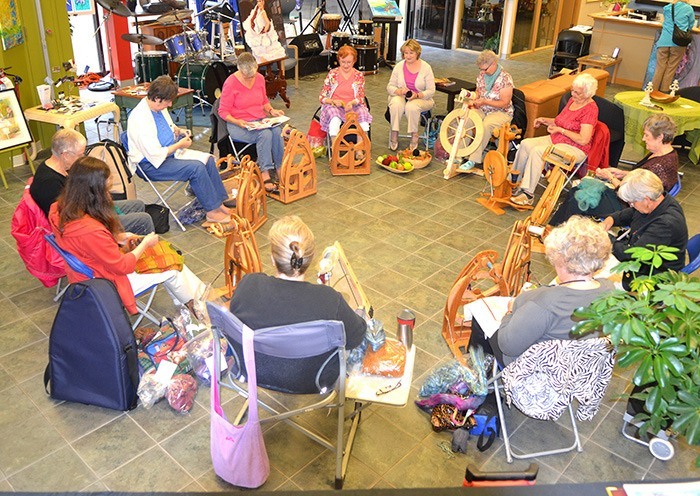 Members of the Langley Weavers and Spinners Guild have found a cozy new place to practise their craft. On a Thursday afternoon in early September about a dozen members of the guild’s daytime spinning group set up for the first time inside the Langley Arts Council building on the Fraser Highway one-way and went to work for a few hours. The Langley City gallery, which is open to the public, will serve as the spinners’ meeting place on the first Thursday of every month, explained nine-year member Maureen Dones. Visitors are welcome to stop by to watch them work and to ask any questions they might have. Part of the guild’s mandate is educating people about their processes and the materials they use. Despite the group’s name, the Langley Weavers and Spinners draw members from as far afield as White Rock, Surrey, Aldergrove and Abbotsford. So being able to meet in the middle is a plus. “This (LAC gallery) is such a nice central location for us,” said Dones. Arranged in a large circle, the women work on wooden spinning wheels, each feeding through any of several natural fibres from sheep’s wool to llama, alpaca, goat and even rabbit. The use of locally produced fibre is encouraged wherever possible, said Dones, who raises llamas on her property on the Aldergrove-Abbotsford border. “And we try to give it an artistic flair,” she said. In addition to the daytime spinners group, the guild includes an evening spinning group which meets at members’ homes, as well as a weavers group and an evening knitting group who call themselves the Crazy Clackers. The guild has been in existence for more than 40 years and boasts about 100 members among its chapters, who gather as a collective on the third Tuesday of the month inside Sharon United Church at Murrayville’s Five Corners. As well as giving demonstrations at the recent Country Celebration in Campbell Valley Park and Art in the Untamed Garden in Glen Valley, members are busy preparing for Beyond Fibre, their annual juried artisan sale, which takes place Nov. 2 and 3 at Fort Langley Community Hall, 9167 Glover Rd. Among the rules of the show and sale is that participants must use natural, hand-spun fibres wherever possible — the more locally sourced, the better. During the two day event, which runs from 10 a.m. to 5 p.m. on Saturday and 10 a.m. to 4 p.m. on Sunday, members will offer demonstrations of weaving, spinning, knitting and felting. Visitors may purchase completed projects or gather supplies to create their own. The show will also feature new and returning guest artisans, jewelry, pottery, stained glass, mixed media, photography and leather works.